You’re standing in the basement waiting for a friend, who is following you down the stairs. Missing a step, your friend reaches for the railing, which breaks away from the wall. This will not end well for your friend, who may be seriously injured or worse; and it may not end well for you, because of the law suit and liability claim that will follow, and the friendship that will almost certainly end. This isn’t an article about the importance of having adequate insurance; it’s about the importance of having secure railings on your stairs. Accidents related to stairs are the second-leading cause of accidental injuries in the United States, according to the National Safety Council, responsible for 12,000 deaths annually and for non-fatal injuries costing $92 billion a year. Only automobile accidents take a higher toll. There are no statistics indicating how many of the stairway accidents are caused by faulty railings, but as the incident described above illustrates, the stair rail can make the difference between a close call and a disaster. Handrails or stair railings, which are installed along one or both sides of a stairway, providing a surface to grab to prevent falls down the stairs or over a stairway’s open side. Guardrails, providing a safety barrier to keep people from falling off or through stairways, balconies, decks, and porches. Building codes establish the safety standards structures should meet; they don’t guarantee that any specific structure complies with them. For one thing, building codes change over time, usually in response to incidents that highlight inadequacies in them. (Allowable baluster openings got narrower because children kept falling through them.) Older homes, covered by earlier codes, won’t necessarily incorporate those changes. Newer homes may fall short as well. Municipal building inspectors who issue occupancy permits, ostensibly certifying code compliance, may not notice every shortcoming nor object to every one they find. They would doubtless notice if a required railing was missing, but they might not notice (or decide to overlook it) if the railing was a little shorter than required. Your concern is safety, not code compliance. The question you should ask about railings is not just whether they are ‘built to code,’ but whether they provide the safety a particular stairway (or deck) needs, given where it is located and how it is used. Architects, and homeowners themselves, don’t always put safety first. Architects often make building code compromises to achieve design effects, and homeowners often focus more on the coolness of the design than on the risks it may create. For example, to ensure an unobstructed view while sitting on a deck, the guardrail may be set lower than the 34-38 inches the building code requires. This protects the view, but it doesn’t protect the people who are standing on the deck. At 38 inches, the rail will hit someone of average height at hip level or higher, which is above their center of gravity. At 32 inches, the railing is now below hip level, which means someone who leans too far over the railing or slips will probably go over the side. Another common deck-related compromise is to install a bench around the perimeter, expecting it to serve also as a guardrail. It won’t. The bench may be the required distance from the ground (36 inches), but without a guardrail behind it, which both the building code and common sense require, there is nothing to prevent someone sitting on the bench from toppling backwards off the deck. If you read home decorating magazines, you will notice that using cable in deck railings has become popular. The longer the distance between the cables and their anchor points, the cooler the design. But stretching also makes the cables more flexible and easier to pull apart, creating wide spaces through which small children, or less-than-sober adults, could fall. These risks aren’t theoretical. According to the National Association of Certified Home Inspectors, more injuries result from the failure of deck railings than from the collapse of decks. I’m not suggesting that only conventional designs are safe. The problem, in many cases, is not the design but how it is implemented. Glass railings, which you will find in many buildings today, are a good example. Thetempered glass used in these railings is quite strong, so there’s no cause for concern there. But the exposed glass edges must be protected, and the railings must be secured firmly. If they are inserted in a wood frame (a common structure), there has to be enough overlap so the glass won’t be dislodged if it is hit hard, as it could be by someone grabbing the rail for support. Whatever the design and composition of your railings, maintenance is essential. Aging affects all structures and all materials to varying degrees, but deck railings are particularly vulnerable, because they are exposed to the elements. Rain, heat and freezing temperatures all can take a toll. Wood rots, steel rusts, the connections anchoring railings to the deck weaken over time. Your spring maintenance checklist should include a thorough inspection of your deck and its railings. Repaint the wood if necessary (the experts suggest at least every five years). Make sure all railing connections are secure. Perform a stress test by pressing on the railing to make sure it doesn’t give at any point. 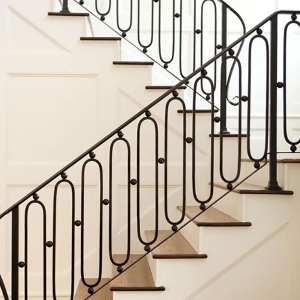 Railings on inside stairs aren’t exposed to weather, but they are affected by age and wear and tear, so you want to inspect them periodically, too. Grab the top rail on a stairway to make sure it doesn’t wiggle at the touch. Shake the rail slightly and notice if it vibrates; it shouldn’t. Perform the same stress test you used on the deck railing; interior handrails are supposed to withstand the same 200-pound force. With regular inspections of handrails and guardrails, you can identify and correct problems before they become accidents you could have prevented. Most of us have heard Smokey the Bear intone: “Only you can prevent forest fires.” A mascot for stair safety might issue a similar warning: “Only you can prevent railing failures.” Ensuring that your handrails and guardrails are safe will help to ensure the safety of all who use them. While local building codes may vary, most track closely, if not completely, the International Residential Code, from which this summary is drawn. Run continuously for the full length of the stairs. Be 34-38 inches above the nosing of the stair treads. Allow no less than 1-1/2 inches of space between the wall and the handrail. Both guardrails and handrails must be able to withstand at least 200 pounds of force applied at any point and in any direction. The balusters should withstand 50 pounds of pressure exerted over a one-square-foot area. Spaces between balusters can’t exceed 4 inches, which is the average diameter of a baby’s head. The obvious purpose is to prevent children from getting their heads stuck in the openings or falling through them.